What can I have for breakfast on low carb? My knee jerk answer (which I say to myself, but do not write until I calm down a little): Eat something else. Literally any other low carb food. There are, like, a zillion other possibilities there. And the same goes for breakfast. You see why I’m a bit dumbfounded, right? I don’t know how this made-up idea came to be canonized in the American dietary lexicon, but contrary to what is ingrained (no pun intended) in so many of us, breakfast does not require eggs, nor bacon, sausages, cereal, bagels, orange juice, or English muffins. Have you ever gone to IHOP or Denny’s and had pancakes or a ham & cheese omelet at midnight? Then guess what: you’ve had breakfast for dinner. And have you ever had cold leftover pizza or Chinese food for breakfast? (Admit it, you have. We all have. Maybe it was back in your college days, but you totally did it, and so did I.) Guess what: you’ve had dinner for breakfast. The solution to this is making low carb foods equally convenient, and the solution to this is cooking in advance. Take a Sunday afternoon or evening and cook two or three packages of sausage links. They’ll be ready to go all week. You can heat them up in minutes, or simply eat them cold. Same with eggs: boil a dozen (or more) on a Sunday so all you have to do is grab a few on your way out the door. Cold bacon is also delicious. Pretty much all foods can be eaten cold. You might not like them cold, but if you’re willing to be a grownup and just get sh*t done, not having access to a stove or microwave at your place of work is not in the slightest an obstacle to eating low carb food. So yeah: if you don’t like eggs, congratulations: there is absolutely nothing standing in the way of you having a perfectly suitable low carb breakfast. Remember my motto regarding this way of eating: it's not difficult, just different. Because of my weird diabetes (or not-diabetes depending which doctor you believe) I eat just enough for breakfast to convince my liver and pancreas that my throat hasn't been cut and I don't require a massive dump of glucose thankyouverymuch. My go-to is a thickly buttered oatcake (5 - 6g carbs) with smoked salmon. After that I'm good to go for routinely 5 - 8 hours and often 11 hours or more before I get hungry again. Most of the day irrespective of what I am doing I am fuelled by stored energy which I replace any time between late afternoon and late evening. Usually I only have one meal a day, sometimes two, apart from the minuscule breakfast. It's a huge contrast from the days when I'd have my bowl of dietician-approved high carb low fat cereal and then be starving again a couple of hours later. I probably don't actually *need* breakfast but it seems to work better than waiting until later in the day to eat. I have been known on occasions to have anything from lamb chops to leftovers, and of course BACON! but my glucometer basically agrees with your It's The Insulin, Stupid mega-series, and my body agrees with the meter, that going long periods without food is totally cool as long as I stay away from the carbs, and is best achieved with a small breakfast, a large meal later and a nocturnal snack. YMMV of course. A Type 1 diabetic friend has a couple of units of insulin for breakfast and then goes most of the day before eating. This regularly gives his doctor and nurses a hissy fit until they notice that he routinely has an A1c below 6% and has maintained this for decades now. Recently I found a paper dating back to the early seventies which showed that ketosis removed the possibility of hypos even in Type 1s, yet another thing that was once understood and since ignored. The tone of this post is rude, sarcastic and patronising. If this is the usual I shall be unsubscribing. 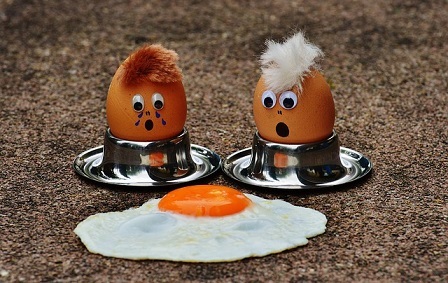 I love eggs, so it's hard for me to believe that people don't want to eat them! Maybe there are nutrients in them that I crave, because I can't seem to get enough of them. Still, there are other things to eat, and when I have to "break my fast" at work, I need to eat something cold. So my favorite "work breakfast" is some deli turkey slices, rolled up and filled with cream cheese, fresh basil leaves, and lots of ground black pepper. Smoked salmon (or actually, any type of smoked fish) is another good breakfast idea, and very common here in Europe, where I live. And of course, cream yogurt with roasted pecans or walnuts, sprinkled with cinnamon.....Well, when it comes to food, I guess I never have problems finding things to eat, since I love food so much. I gag on eggs. I have been eating whatever is handy for breakfast including leftovers. I felt a bit guilty or worried I might be somehow doing something unhealthy but you know what? You just made so much sense. Thanks! Guilt bye bye. :D Glad I could help. I don't even name my meals anymore. I have meal 1 and meal 2. They consist of protien aND fat necessary to hit my goals. Good post! I have an intolerance to eggs and a huge nausea inducing reaction to eating non-traditional breakfast items for breakfast. I can't do bacon and sausage very often because the grease is also hard on me. Breakfast has been hard for awhile because I'm hypoglycemic so I avoid carb triggers. This meal frustrates me endlessly. Maybe some full-fat yogurt? According to Volek & Phinney, a half cup of yogurt has only 5g of carbs. (Even if the label says otherwise. The fermentation process consumes some of the lactose.) Maybe ham steaks -- those are usually pretty lean, so no grease to turn you off. My favorite breakfast is no breakfast. Intermittant fasting. Your hunger levels are normally lower in the Morning. You can plan on an earlier lunch. I find lunch at 11:30 after not eating breakfast or just a small snack for breakfast like nuts and cheese works fine. Old saying "smoke me a kipper, I'll be back for breakfast"
A whole kipper is altogether too much food for me but might suit someone who needs a bigger breakfast. Mainly I eat them later in the day, with toasted almonds, spinach and a thickly buttered oatcake. Probably best if you do not even LOOK at the recipe for kedgeree from Diabetes UK as apoplexy may induce a heart attack. Thanks for this great post. I really needed to read this today, and your egg-free ideas are most helpful! Your post is just what I waslooking for. Since everytime I eat more than one egg, though I eat them very seldom, my stomach just refuses to work. That's a really big problem for me. The hearty American Breakfast of eggs and bacon was designed to sell Bacon. My solution to this (since I eat breakfast at my desk and don't like eggs)- cottage cheese with pistachios and tomatoes. I've been eating that for years and it's the best.